What would you buy if you won £20,000? That is the happy dilemma JG Speedfit wants to give one lucky installer with its national campaign, ‘20 Grand in Your Hand’. JG Speedfit, the leading British manufacturer of push-fit fittings, is launching a new promotional campaign involving its best-selling product, the 15mm Equal Elbow. The elbows, which are often sold as single units across the counter at stockists, will be offered in specially packaged multipacks of ten. Each pack will have a unique code, allowing installers to enter the competition, which is being run nationwide for 26 weeks from April to September 2018. As well as the £20,000 cash that will be won by one lucky winner at the end of the competition, installers will also be entered into a monthly Speedfit Tech Bundles draw, to show JG Speedfit’s commitment to technology. Each bundle is worth over £1,000, and gadgets up for grabs includes an Apple iPhone 8 (64GB), an LG 49” 4K HDR Smart TV and a PS4 Pro Games Console, amongst many others. Also, as part of its sponsorship with the Kawasaki British Superbike Team, JG Speedfit will also give away VIP tickets for the BSB Championship 2018. 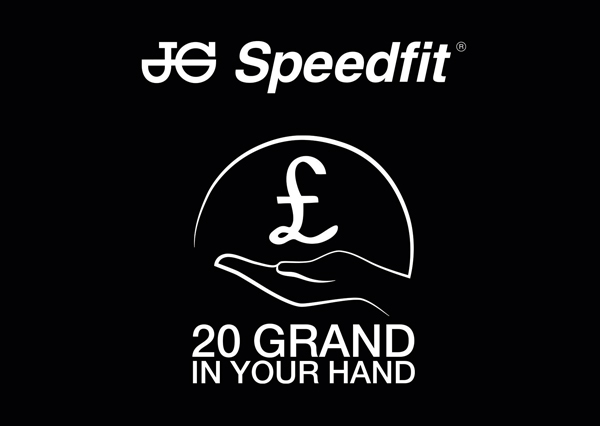 JG Speedfit’s ‘20 Grand in your hand’ promotion will launch on 3rd April 2018 and finish on 29th September 2018. The winner of the £20,000 cash will be announced in the first week of October. For more information on the competition please visit www.speedfit-giveaway.co.uk.